The committee should be both doers of personal evangelism as well as leaders of congregational evangelism. Some churches will overlap these roles with their hospitality committee, outreach committee, marketing team, or new member committees, so these role silos are not precise but general guidelines. What is the job of an evangelism committee at church? Items #6,7, and 8 may be separated to the church hospitality committee. Each evangelism committee member should be doing the work of personal evangelism. Building authentic relationship with lost people. Actively sharing faith with those who don’t know Christ. You can’t lead where you haven’t been yourself, so make sure you are on the leading curve of personal evangelism in your church. Many church members are afraid of evangelism and find themselves wanting to invite people to church and let the professional do it. You might want to run short courses via small groups, sermon series, or even virtual classes with an outsider like me. There are many great resources in the market place to help you run a seeker oriented group. You might run courses that allow people to investigate Christianity and allow a safe place for people to ask their questions. The Alpha course is one example of such a study, or you can do a topical study aimed at life skills which helps a person see the relevancy of the Christian life. your team would need to lead and organize such events. As you prepare for these events, remind people to look for conversational opportunities to talk about their faith. As other ministries of the church plan their events and activities, members of the evangelism committee always raise the banner of reaching those who don’t know Christ. How does this help people know Jesus? How does this help us share our faith? What steps can your group take to reach lost people? Can we make this event more public and increase invitations? Would we feel safe inviting our friends to this retreat or small group? 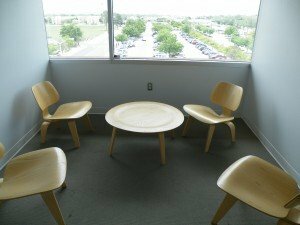 Are we meeting too much and not out in the community? ministering to a person during journey to Christ. Churches cannot increase their influence towards salvation if a person doesn’t come back a second time. Hospitality practices aid in getting multiple visits. Focus on developing greeters and a great guest experience. Make sure your volunteers can access training to improve their hospitality skills as well as conversational skills. If your church has a welcome center, this committee will make sure it’s staffed and that visitor appreciation gifts are given out. Make sure gifts are appropriate for the season and/or the sermon series. Evangelism committees are interested in helping a newcomer connect with the church. After their first visit, what is the next step to building relationships? 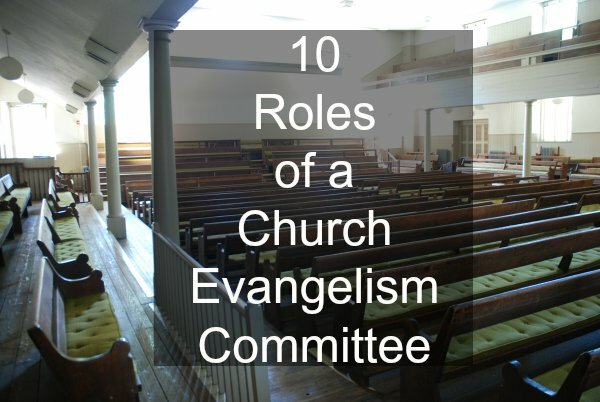 One potential role of the evangelism committee is to organize and manage this process. Evangelism committees should always be thinking about how the church can reach its community. Churches are not a fortress, but are the people of God on the mission of God. You might do that through organized prayer walks, prayer stations, and prayer booths. You might do the visitation of local non-profits that are serving in various needs to learn more about what the church might be able to do. Evangelism committees would lead the research and project development and empower volunteers to rise up and serve. Effective low cost marketing will assist your normal word of mouth efforts to increase the number of first time visitors to your church. Great article to use as a measurement in the work our team is doing. Can you tell me more about a “virtual class”? We have an educational opportunity coming in October for which I am trying to set up “work shops”. The idea of using skype had crossed my mind and then I see this mentioned in your article! A virtual class is where I visit like Geroge Jetson. . .. . over a computer monitor, hooked up to a projection system. There are different and better ways that skype to make that work, but I’ve done it with churches in VA, MD, DC, and Puerto Rico. I’ll be trading some emails with you personally to help you get started. I look forward to it. If you want to start learning about evangelism from me, start with this particular link. There are over 50 articles gathered there to learn about personal evangelism as I teach it. Enjoy. Rather than evangelists, maybe churches can do a better job at teaching personal evangelism? While the evangelist is the gift to the church (Ephesians 4:10ff) it’s all our responsibility to witness. We can provide teaching and training to help the ordinary person share their faith without being obnoxious. I found this and it was very enriching. I am an Evangelist by the Will of God. I head the evangelism ministry of our church and direct world missions programs as well. I will need to get more about this so the Kingdom can grow. Thank you. Jesus is Lord. Thanks for stopping by. . . There are plenty of articles on this website aimed at helping a believer become a better personal evangelist. I teach a hybrid method of relational and contact evangelism, meaning my evangelism style could work with both of those styles. Hello my brother, I am a minister of evangelism, in the process of being ordained as the Pastor of Evangelism and Outreach and I would love to keep in touch with you, regarding ideas that you can share with me to further the gospel and represent Christ as the Kingdom of God. My email is robertamiller39@gmail.com. since evangelism is the heart of God for the lost, substantiate your research findings with scriptures lest it be reduced to human opinion for the work of God. Pastor Calistus, Thanks for stopping by. . I invite you to dig further in my website about evangelism. If you want to start learning about evangelism from me, start with this particular link. There are over 50 articles gathered there to learn about personal evangelism as I teach it. I’m so grateful to God to stumble on this site, I know it’s the Holy Spirit leading, I has just being appointed as the director of evangelism in my local assembly and I need information on how to be effective, please sir I need your assistance, I’m Edinor Shehu from Nigeria. Thank you sir. Full of lessons. May God give you more so we can always learn. Thank you. Am an evangelist in making.I love speaking, preaching this good news to people…and i believe i have been called for this..Plz help me start off n build up towards evangelism.It has been sweet to serve and lead a group in this ministry…i love to be in the house of the Father. Lucy Iraya from Kenya…..
Just started a new evangelism committee in a church that need a lot of revival. What is our first duty in such a church.Or the responsibilities of the committee. I have put in charge of our church evangelistic team, my question is how do you get and keep your team motivated. I would appreciate any help. Lee, The greatest way to keep a team motivated is two fold: 1). Continue to model personal evangelism yourself and 2). seeing people take steps to faith and celebrating those. lovely may God bless you, nice teachings.